IBM® Lotus® Protector for Mail Security extends email security and compliance for your social business platform. It scans email messages and attached files for unwanted, confidential or malicious content to control the email content that enters and leaves your company’s network. Lotus Protector for Mail Security helps ensure a high level of email security and compliance, and blocks spam and viruses. It also provides integrated email content filtering for IBM Notes®, IBM Domino®, Microsoft Exchange and mixed email environments. Use the latest IBM X-Force® security data to filter content. A phishing analysis module can help identify fraudulent email and protect users against emails targeting personal information. Enable custom spam filtering, define senders and recipients, and specify delivery times. You can create rules-based policies to identify the analysis modules to be used based on various conditions. Place content filtering technology at the network gateway to optimize the volume of messages that can be handled throughout your business. Explore Lotus Protector for Mail Security functionality, with the ability to switch to a full commercial version. 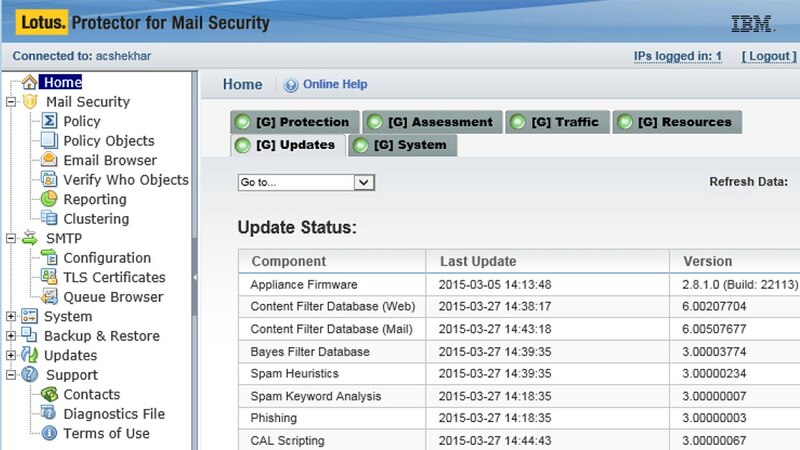 Implement the full commercial version of Lotus Protector for Mail Security.